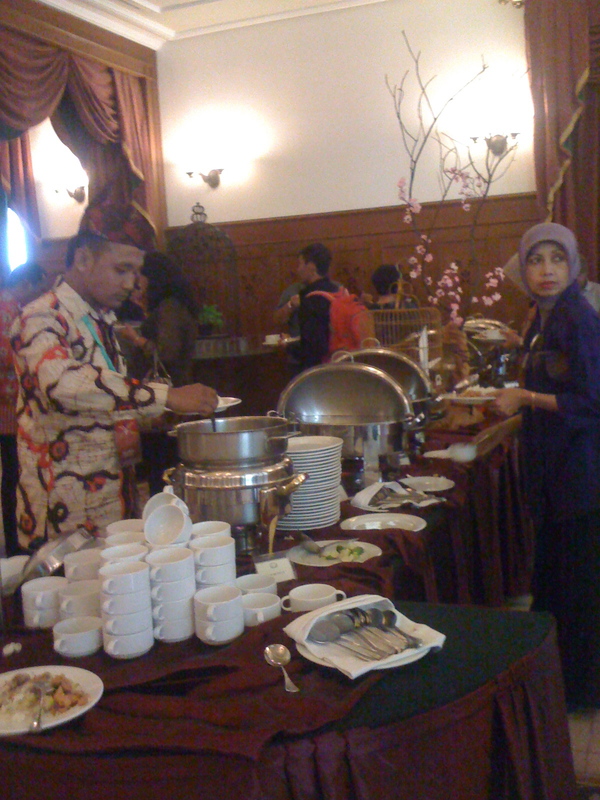 On 12-13 July 2012, the Indonesian Ministry of Tourism and Creative Economy, Ministry of Education and Culture, and the East Java Regional Government organized a workshop on art and culture in Hotel Majapahit, the most distinguished heritage—and perhaps also the most expensive—hotel in Surabaya. 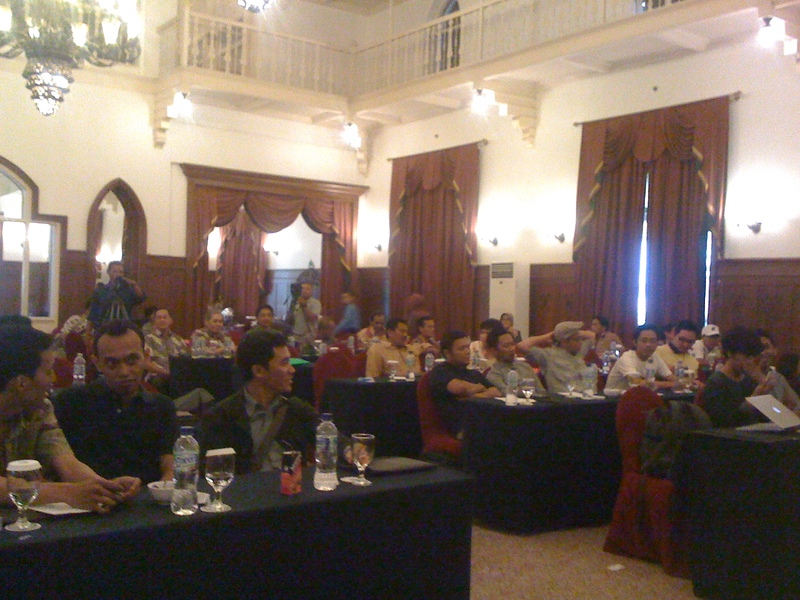 All heads of Taman Budaya, as well as Culture and Tourism Board from over 27 provinces in Indonesia, were invited for this workshop. 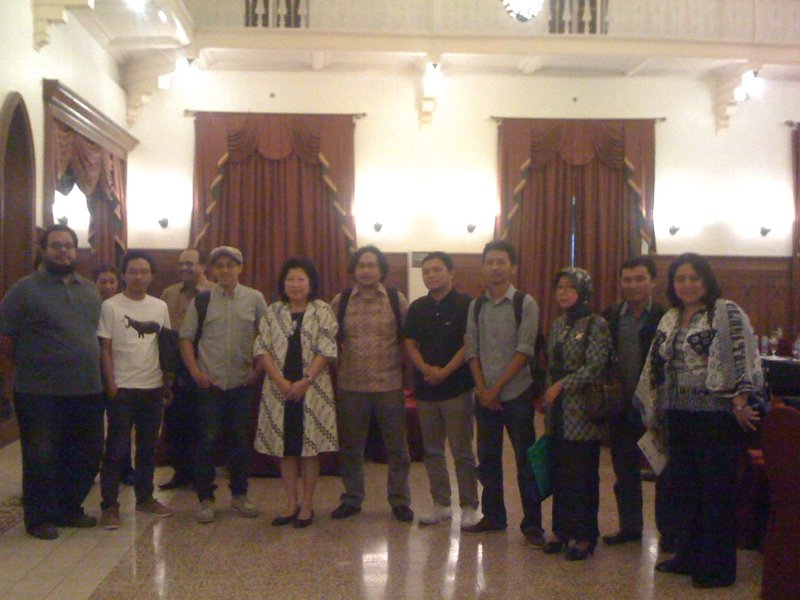 One of the main objectives was to reactivate and to revive various, oft-neglected, Taman Budaya in Indonesia. It aims to rejuvenate Taman Budaya with more diverse events and programs, that’ll hopefully involve youths, creative industry sectors, and thus revitalize it as a hub for arts and cultural activities. What was peculiar, however, not a single youths, creative industry business or community representative was initially invited to this event. (Check out the invitation.) 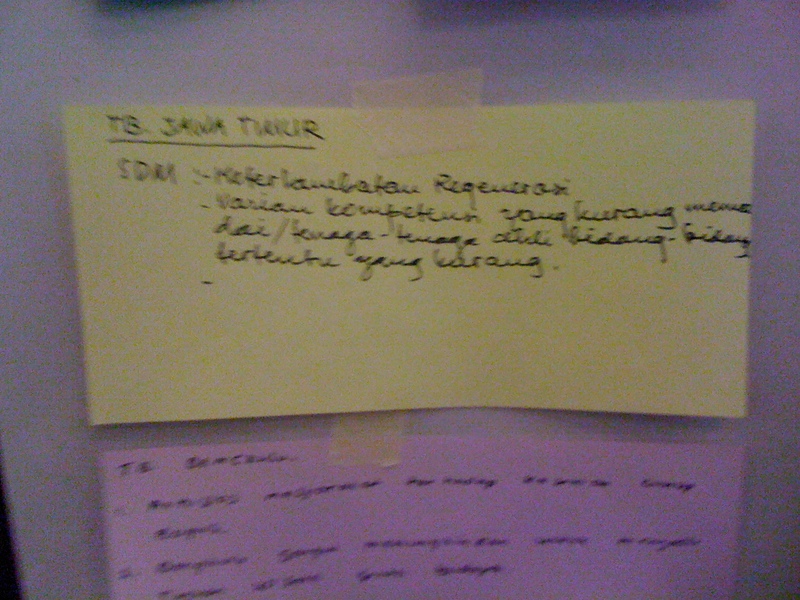 Gustaff H Iskandar from Common Room (Bandung) as the assessor team then had to—at the very last minute—invited us to at least watch and be involved in this dialogue. 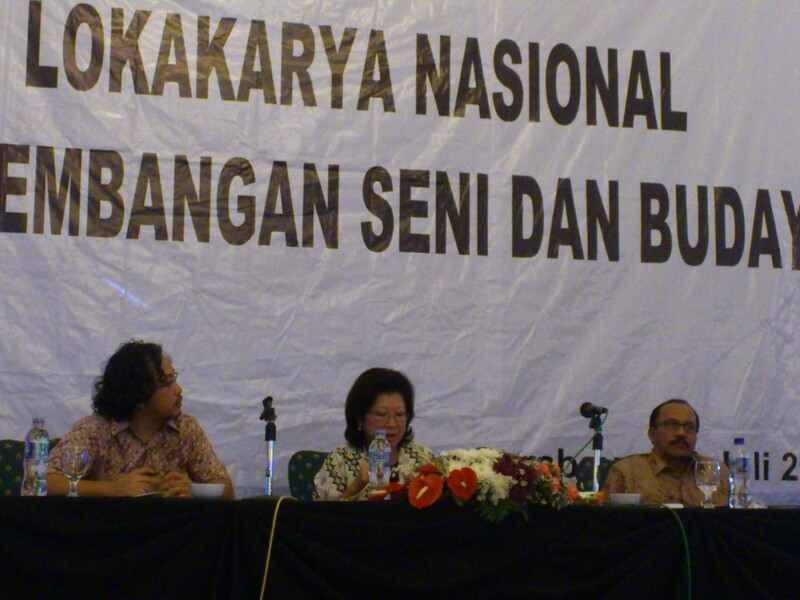 Left: Gustaff, Dr. Mari Elka Pangestu, dan Ukus Kuswara. Right: Photo session, the usual. The highlight of day one was a presentation by Dr. Mari Elka Pangestu about Indonesia Kreatif as the main program of the Indonesian creative economy development. (Do read the PDF, available for download online: rencana pengembangan industri kreatif menuju visi ekonomi kreatif 2025.) Sorry we couldn’t get the powerpoint slides, but we managed to capture almost all of them on photos. We’ve compiled them as PDF, available for free download. 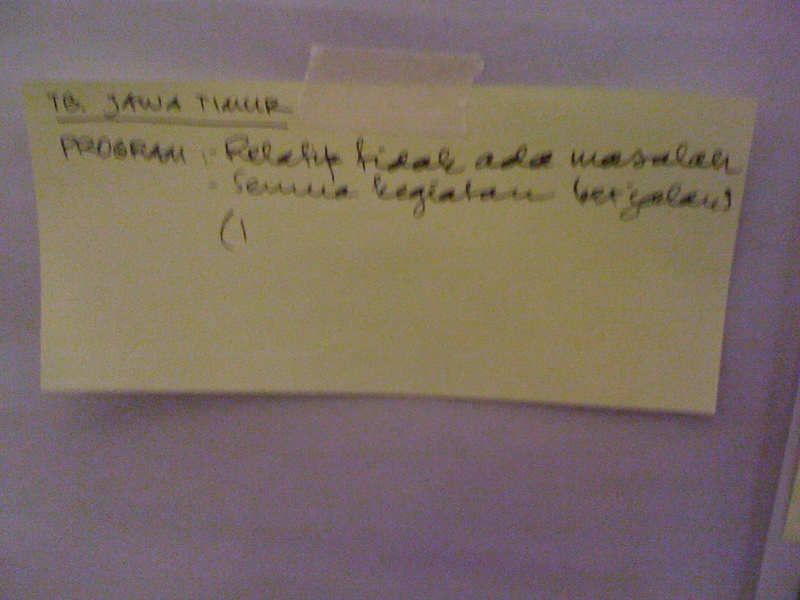 Common Room folks had also generously shared their own draft, which contains plenty of similar slides. Many questions were raised, from the most general such as, how the government is going to achieve these grand but seemingly abstract plans and ideas, to technical and detailed questions about new technology. 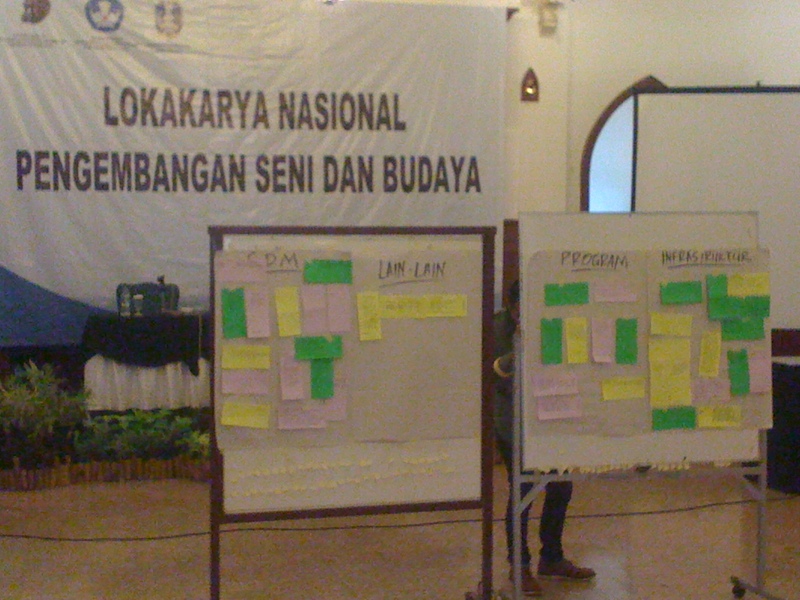 Day 2 focused on evaluating and getting an overview of the current conditions of Taman Budaya from all over Indonesia. 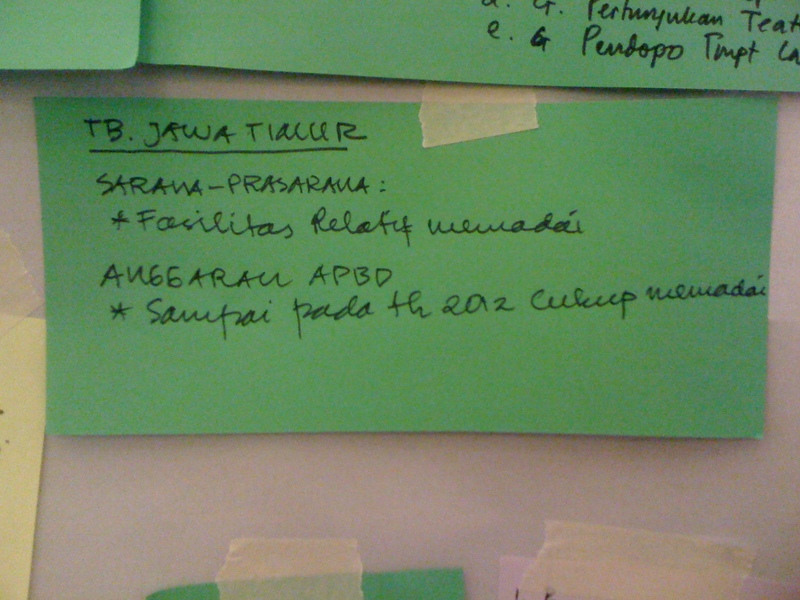 Endo Suanda gave a presentation and overview, then Common Room folks proceeded doing a brief SWOT analysis. Imagine trying to clean up and streamline years of extremely convoluted bureaucracies, corrupt practices, and suppressed discontents from over 27 provinces with very diverse cultures, languages and degrees of technological infrastructures. Some dramas ensued, but not particularly worth elaborating here. Honestly, we were kind of intimidated with the beast that we were seeing, and were rather at loss at what we can contribute. However, as “urban” youths, perhaps commonly associated with contemporary arts and urban culture (whatever their definitions are supposed to mean), we’d like to repudiate the clichéd presumptions that we’re not interested in Taman Budaya and (its connotated association with) traditional arts & culture. Au contraire, we like—and learn and read about—”traditional” arts & culture, but we dislike this kind of compartmentalisation of arts and culture frozen into “traditionalisation”, that refuses to let us learn and adapt them. We are not against the government or bureaucracy, but trust is earned, not instantly given. Considering the notorious track record, we at least want information transparency and dissemination. 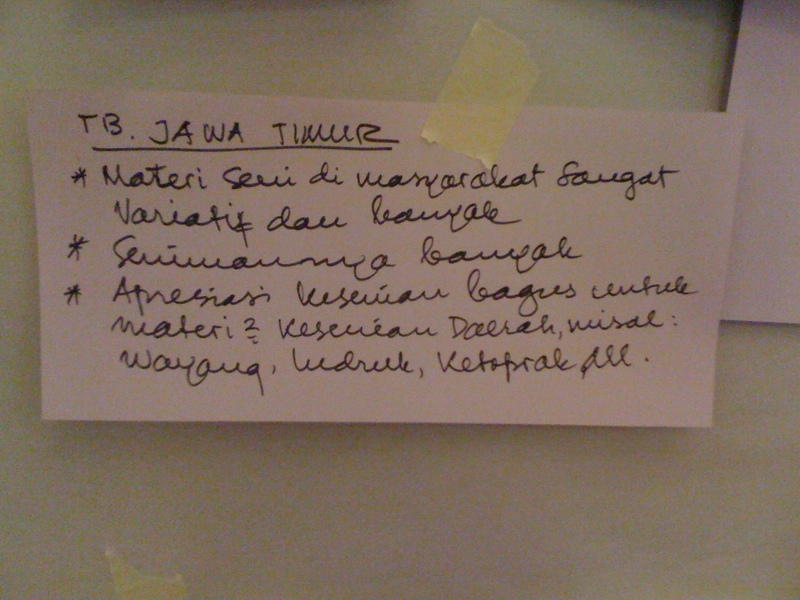 For example, by ensuring clear and legal terms and conditions for utilising the facilities in Taman Budaya. We want clear procedures. We do not want corrupt officers or dubious charges. And we’re not disinterested to Taman Budaya events—we just never heard of it. (Try googling Taman Budaya Jawa Timur and see that the last update on its website is 2008.) Having an active media—a regularly-updated, well-designed website integrated with social media such as twitter and facebook—where we can easily gain information about current activities is an absolute prerequisite. A monthly magazine/bulletin would be a bonus—it doesn’t have to be in colour, but must be regular and well-distributed, not stacked somewhere compiling dust waiting to catch fire. Perhaps try considering using Creative Commons BY-NC-SA as a licence. 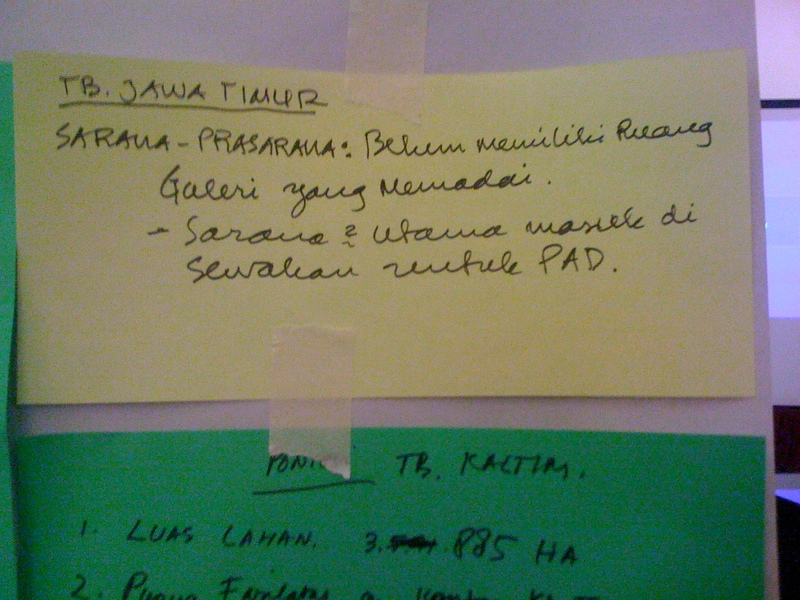 On a brighter note, the Taman Budaya of East Java reported having no problems in terms of facilities and funding (see the post-it notes above), except for gallery and human resource regeneration. The Taman Budaya of East Java, to the best of our knowledge, boasts one of the best cultural facilities in Surabaya: an amphitheater, an auditorium with relatively good acoustics, a pendopo, rooms for visiting artists, a large parking space, and a pretty strategic location. It definitely has a lot of potentials as a hub for cultural events, residencies, etc. Overall, bearing in mind past disappointments, this is a commendable attempt that requires cautious optimism and participation.